The objective of organising the debate was to give an opportunity to the students to provide their views and recommendations that would benefit the country and the government. 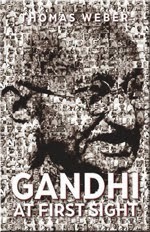 Life of Mahatma Gandhi is painted on 42x135 Cm. canvas in 111 events in color. A narration is prepared in Hindi and English. Painting is unrolled and showen with narration to audience. On the basis of painting a set of 10 postcards is published on Gandhi's life and are available at Gandhi National Museum,Rajghat,New Delhi. Nandini Voice For The Deprived, a Chennai based NGO, organized All India essay competition on “My views on declaring Bhagawad Gita as national scripture”. There was good response for the essay competition from all over India. Gandhi's face has returned to mass media. We now need space for Gandhi's mind and heart. Is the nation, we the people, heading in the right direction? Are the pictures of Gandhi and his principles remain just in the campaigns and posters of current government? Is it enough to talk and hail Gandhi only in meetings? Centenary of Gandhi's arrival to India from South Africa. Religious Conversions - Why Should a Hindu cling to Hinduism?